Exploring Beaver County – Rochester, Pa.
For the fourth stop in my Exploring Beaver County blog series, I hopped on the old bike and headed across the Beaver River to the place of my birth, Rochester. I have to admit, I’d been putting off this particular exploration, not because I wasn’t looking forward to exploring the town, but because…well…Rochester is just so darn hilly! 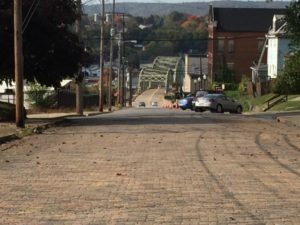 By the time I’d pedalled all the way up from Bridgewater, across the “Beaver” bridge, and then up the hill past the Giant Eagle, my quads and lungs were on fire. And I knew there’d be plenty more burning to come. 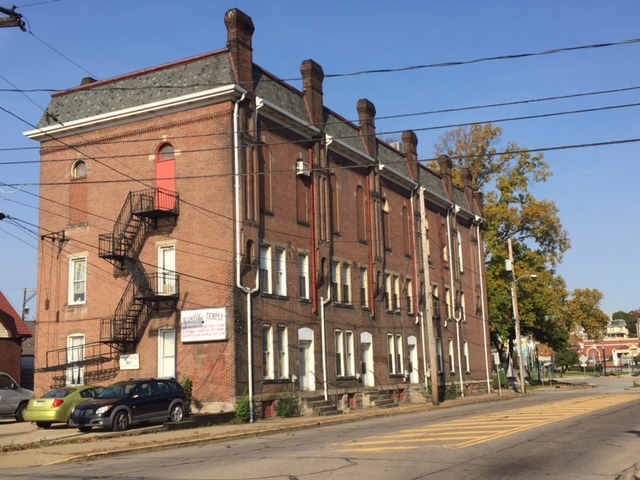 Rochester is another Beaver County town that’s seen its share of hard times. But unlike other county towns that suffered mainly due to the big steel decline, Rochester, like its neighbor Bridgewater, was irrevocably changed by the building of a highway. You see, it used to be that traffic would flow through Beaver along Third Street, down into Bridgewater along Bridge Street, and then up into and through Rochester along W. Madison Street and Brighton Avenue. But by the mid-1950s, ever-increasing traffic led to the construction of Routes 51 and, soon after, Route 65. These new highways eased the overall congestion but redirected traffic away from Bridgewater’s and Rochester’s downtown districts. And as traffic declined, eventually the businesses did too. The collapse of the steel industry simply added insult to injury. And thanks to some poor planning by PennDOT (go figure), for a long time Rochester was known as The Town with the Worst Intersection in the Universe! Okay, maybe I made that up. But pretty much everyone I know avoided going through the town whenever possible, if only to avoid sitting in what seemed like the longest traffic light in the world. Fortunately, this legendary intersection from hell was corrected through the installation of a much more efficient roundabout. But not before a lot of damage was done. Today Rochester is struggling to find its identity. But thanks to some energetic members of the community, efforts are underway to bring new life to this historic town and celebrate all that it has to offer! 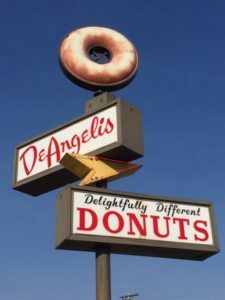 Before I hit the main drag, I rode past one of my absolute favorite places around: DeAngelis Donuts. When I was a kid, I always loved it when my dad would take me here for a donut and hot cup of tea when we were out running errands. I still get a thrill when I walk inside this Beaver County landmark, walk past the vintage counter, and see (and smell) the freshly baked treats. And I love that they still have the old original sign out front, topped with a giant glazed doughnut. If only it were real! Rochester’s business district runs along Brighton Avenue, and that’s where I officially began my day’s exploration. My first stop: Jamie’s Treasures, Antique & Things (184 Brighton Ave.). I’m always drawn to antique stores, especially ones where you can tell the owner has an eye for picking. And Jamie’s is definitely one of those places. What’s cool is that it’s actually three different stores: Jamie’s Antiques, Jamie’s Treasures, and Jamie’s Over Flow. You can tell they really put a lot of time and effort into their three stores, and a little birdie told me that their sales go to a good cause. So be sure to remember them come holiday shopping season. After a little treasure hunting at Jamie’s, I continued my hunt across the street up at RiverTown Antiques (219 Brighton Ave.). This is another one of my favorite antique stores. It’s a big place that you can spend a lot of time in. Believe me. I know. Plus, they always have a few cool typewriters in stock. Which, let’s be honest, is pretty much the only thing I’m ever looking for. Next up I popped into a Rochester landmark: Fritz’s Hair Styling (221 Brighton Ave.). 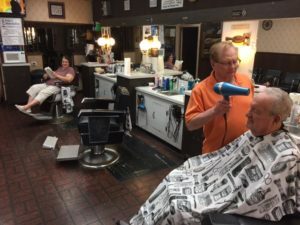 From the time I was but a lad to well into my adulthood, I spent many an hour in this classic clip joint, getting my ears lowered and enjoying the fun, neighborly atmosphere made possible by the place’s amiable owner, Alan Fritz. (Little Known Fact: Alan actually sung karaoke at my wedding. Yes, we had karaoke at our wedding.) I know it’s a cliche, but Fritz’s always reminded me of the fictional “Cheers”, with Alan playing the part of Sam Malone. (Google it, kids.) It’s always been the kind of place where everyone knows your name, and where you’re always guaranteed to get a few good laughs, as well as a great cut. The bottom end of Brighton Avenue is dotted with various shot-and-a-beer type saloons, relics of steel-mill days gone by. Near the upper end of town, however, just behind Young’s Jewelers, you’ll find Hollywood Gardens (169 Pinney Street). This is one of my favorite restaurant/neighborhood taverns around, and it shows what you can do with a little imagination. Hollywood has one of the best craft beer selections anywhere, with rotating taps featuring a variety of brew styles including ones from Brixton Brewing, their house label. I really think Rochester, much like Beaver Falls, could end up becoming a trendy treasure hunting and foodie destination spot. Whenever we’re on the road, my wife and I always pull over in towns where we find antique/vintage shops and independent eateries. And I know there are tons of others out there just like us. Rochester already has a few spots like this. Sprinkle in a couple more and you’ve got yourself one cool, happening town. Leaving Brighton Avenue, I made my over to the Rochester Public Library (252 Adams Street). I’m a big believer in the value of libraries as community centers, and Rochester has one of the most charming book-loaneries around. Housed inside a Victorian-era home, it offers a unique, cozy type of atmosphere to get a little work done or just relax with a good book. If you’re the kind of person who likes to actually own your books, upstairs you’ll find an amazing selection of used tomes on sale for a very fair price. Legs on fire, I huffed and puffed my way further up Adams Street and popped into Kelly’s Hobbies (420 Adams Street). I’d driven past this place a bunch of times and always wanted to check it out. I’m glad I did. Inside there’s a ton of plastic models for the model-building enthusiast. I used to love building classic cars and fighter jets with my dad back when I was a kid. (I think I still have some model glue stuck to my fingers.) Kelly’s also has a nice selection of slot-car tracks an model train stuff, too. Although I didn’t stop there this particular day, I’d be remiss if I didn’t mention one of my favorite somewhat newer places in Rochester: The Fairport (318 New York Ave.) Formerly the old Hilltop Restaurant, The Fairport is a neighborhood restaurant with upscale fare. Tucked away on a side street, unless you knew it was there, you’d never even see it. And that’s a shame, because it’s a great place with great food. One of its coolest features is its classy bar area, where you can enjoy a cigar (if you’re so inclined) while sipping on some of the best bourbons around. Last but not least, down along the Ohio and Beaver rivers, Rochester offers one of the nicest riverside parks in the county. 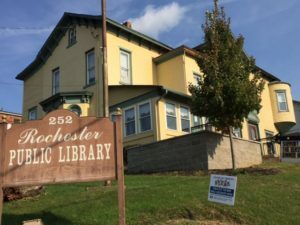 Whether you’re looking for a safe, scenic place for a leisurely stroll (the park features a 2-mile paved walking route), or maybe somewhere to do a little peaceful angling, Rochester’s riverside is the place to be. My Hero’s Sub Shop — Subway schmubway! Get yourself a real sandwich here. Hollywood Gardens — At least a dozen draft craft beers. Need I say more? 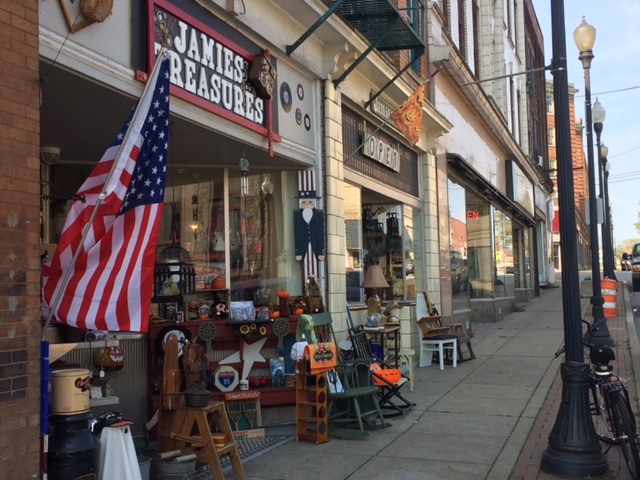 Jamie’s Antiques and RiverTown Antiques — Treasures galore! Fritz’s Hair Styling — Tell Alan that Val sent ya. Rochester Public Library — If you couldn’t already tell, I love libraries. Check this one out! Riverfront Park — A peaceful spot offering many wonderful views of both the Ohio and Beaver rivers. 2 Responses to "Exploring Beaver County – Rochester, Pa."
become an established and successful business. A few years ago my Nephew asked me to come work in his kitchen, and so I did. He still has my name on the menu of Aunt Mary’s Brushetta even tho I am retired now. Your article was so wonderful and so very much appreciated by our family.Thank you Mr Brkich so very much!! Thank you, Mary! I really appreciate your kind words. Frank is a great guy and we love Hollywood Gardens! 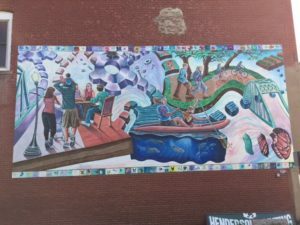 Exploring Beaver County – Monaca, Pa.